This campaign ended on December 03, 2017, but you can still make a gift to College of Charleston by clicking here! Food insecurity is a growing challenge for college students across the nation, and the College of Charleston is no exception. That’s why we’ve partnered with the Student Alumni Associates to raise $10,000 to #SwipeAwayStudentHunger! 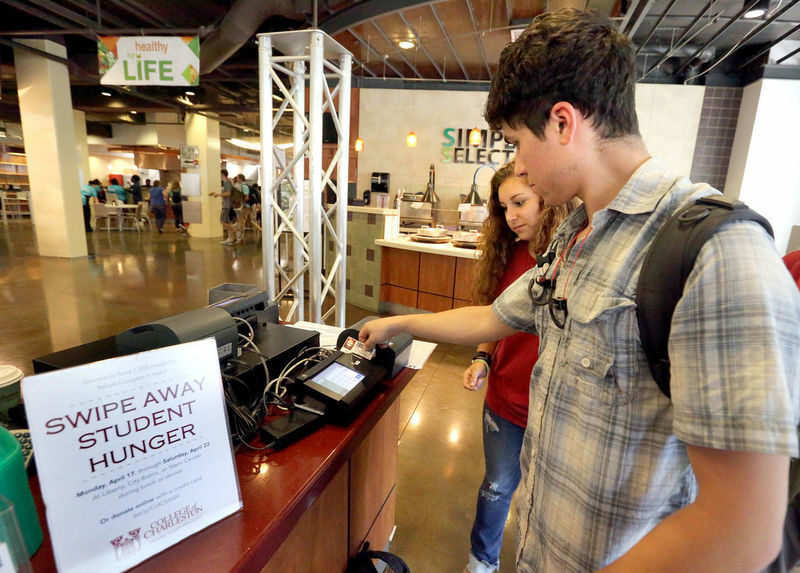 $10,000 will provide more than 1,000 meal swipes to College of Charleston students in need. During the week of November 27 through December 1, students can donate meal swipes and dining dollars in front of Liberty Street and City Bistro dining areas during popular lunch and dinner hours. Alumni, parents, employees, and friends can join the fun with their own gifts here. Every dollar donated through this page will directly supply meal swipes to CofC students. Together, we can swipe away student hunger at CofC! Some colleges are setting up food banks. Has CofC considered this option? Yes. A food bank requires storage space and trained staff to manage it properly to ensure food safety and good nutrition. At CofC, many students don't have access to a kitchen to store and prepare food. Considering these factors, meals through the College dining program are the most cost effective and efficient option for CofC. It is also confidential and treats the students with dignity, loading meals onto their Cougar Cards to be swiped just like other students with meal plans. How will the funds be distributed to students? Students will complete an application through Student Affairs, and Financial Aid will verify the need. Applications are completely confidential and will be evaluated on a case-by-case basis to determine the number of meals to be provided. Once approved, the meals will be applied to the students' Cougar Cards. Yes! Your donation is deductible to the extent allowed by law. Please check with your tax professional for details.